Grant Yarbrough and his wife, Holly Teresi Yarbrough moved to Huntley Hills in 2014. Grant and Holly met at Georgia State University where they were both pursuing graduate degrees. Grant is a lifelong resident of Atlanta. 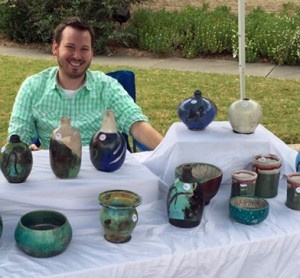 He attended high school at Pace Academy where he first developed his love of pottery and ceramics. He studied under the tutelage of Rick Berman where he learned the japanese glazing techniquees of Raku and Salku. 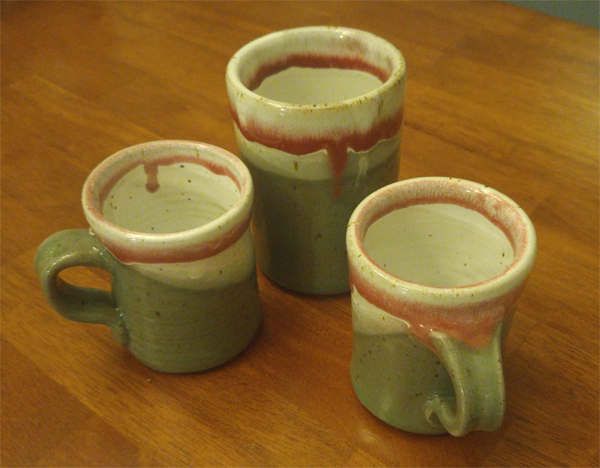 Both techniques involve heating glazed pots to a high temperatures in specially made kilns. With Raku glazing, the pots are removed when they reach 1500-1800 degrees and rapidly cooled with water in a bed of either sawdust or shredded newspaper. In a Salku firing the pots are placed in a kiln and filled with salt, charcoal, shredded wood, glass, or other “debris” and fired to 1850 degrees for a short time, then quickly removed. Grant’s pottery follows a more decorative motif featuring bowls, jars and globes; he focuses solely on wheel throwing . While a hobby now, Grant does hope to install a wheel in his house at some point and if he wins the lottery (and Chamblee OK’s it) a Raku Kiln as well. All Grant’s pottery is for sale. Contact him at 571-358-8302.